Great spec red and black. This watch has small details that make it great. It has the big adidas logo in the front and then small adidas logos in the clasp and the Straps. New with tags no box Mens Adidas Santiago XL Watch ADH2969 Black And Red NWB. Condition is New with tags. Adidas Archive M1 Watch. Material: Stainless steel & hardened mineral crystal. Be sure to complete all fields to ensure prompt turn around. Band: 5 link stainless steal. Colour: Silver Black Blue. Products with multiple sizing options will have a size selection above the Buy It Now button. NEW ADIDAS ORIGINALS SANTIAGO WATCH WHITE W/SILVER TREFOIL. It features a striking all white dial which is bare of indices, however is decorated with the iconic Adidas logo. Gender: Unisex. A prominent case gives a retro look to a glossy monochromatic watch dominated by a contrasting logo on the numberless sunray dial. Dial Color: Black / Multi. Case Material: Rubber. Adidas Unisex ADP6085 Questra Digital 3 Stripe Black Watch Polyurethane Band. Features black polyurethane band with indented white stripes and buckle closure. Mineral crystal dial window. Minor scuff marks and few light surface scratches on bezel. You'll want to change the battery soon. Adidas District Lx2 Watch. Colour: Silver Black Tan. Be sure to complete all fields to ensure prompt turn around. Products with multiple sizing options will have a size selection above the Buy It Now button. Adidas District M1 Watch. Material: Stainless steel with hardened crystal. Band: Milanese Stainless Steel Bracelet, 20mm Width. Be sure to complete all fields to ensure prompt turn around. Products with multiple sizing options will have a size selection above the Buy It Now button. Dial window material type﻿ Mineral Crystal. Item Shape Round. Dial color red 2 years factory warranty. Band Color light blue. Model number ADH2871. Part Number ADH2871. Gender: Unisex. Material Case: Stainless Steel. Material Band: Stainless Steel. Watch Information. Model Number: ADH9078. Band Material: Silicone. Clasp: Fold over with double push button safety. Band Color: Orange. XL (49 - 55 mm). Watch Shape. Watch Shape: Round. Type: Casual Watch. Type: Sport, Digital. Strap Color: Red. Case Shape: Oval. Case Thickness: 12mm. Product Features: Water Resistant. Model # ADH9200. Enjoy the 'Candy' in all color ways, not only for fashion but function as well. Dial : Digital dial, size 32mm. Style : Unisex Watch. Mineral Crystal Dial for Scratch Resistant. Very hard to find now. Adidas District M1 Watch. Material: Stainless steel with hardened crystal. Band: Milanese Stainless Steel Bracelet, 20mm Width. Be sure to complete all fields to ensure prompt turn around. Colour: All Rose Gold. It shows minor wear as seen in the photos. It appears to have been worn very lightly, as it still has the protective film on the back. It has a fresh battery and is ticking away nicely. as pictured. Analog Display. It’s legitimate on your part to feel a little apprehensive about ordering on the internet or from another country, but we would like to assure you that your watch will reach you safely exactly as promised. White dial. Strap/bracelet: White silicone. Case: Plastic. Brand Name: Adidas Model number: ADH2569 Dial color: Gray textured, silver/gray hands, red second/chronograph hand, arabic numbers @ 12, 3, 6 and 9 o'clock, markers on all remaining hours, red seconds markers on outer dial Features: Chronograph, analog date display, sub-dials for minutes hand, seconds hand and date hand Case: Transparent black acrylic, screw case back Band: Black acrylic adjustable Clasp: Stainless steel fold over Water Resistant: 50 meter / 165 feet / 5 ATM Case dimension: 50 mm (5 cm ) Watch measurement: 10 inches (25.5 cm) Band Width: 22 mm (2.2 cm) MSRP: $95.00 The watch come with original manufacturer's box and packaging included. Addidas ADH3042 Newburgh Black Dial Leather Strap Men's Watch Black nylon case with a black leather strap. Black dial with black-toned hands and index and Arabic numeral hour markers. Minute markers around the outer rim. Dial Type: Analog. Date display at the 6 o'clock position. Quartz movement. Scratch resistant mineral crystal. Case diameter: 48 mm. Round case shape. Water resistant at 100 meters / 330 feet. Functions: date, hour, minute, second. Casual watch style. Limited edition, only 500 pieces in the world. Condition - Used in very good condition. Scuff marks and light surface scratches on bezel. You will want to change the batter in this soon. Dial Window Material Type ﻿ Mineral. Dial ColourWhite. Watch Information. Band MaterialSilicone. Band Width17 mm. Band ColourWhite. Water Pressure Resistance5 bar. Case MaterialSilicone. We buy these through authorized dealers. So you can be sure these are 100% authentic. MODEL - ADH2130. Model Number: ADH2130. Part number: ADH2130. 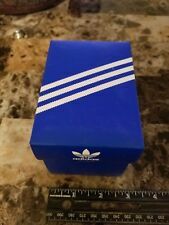 AUTHENTIC ADIDAS DIGITAL RUBBER BAND. Band color: GREY. Watch Information. Special features: Back Light, Stop Watch. Band Material: Rubber/POLYURETHANE. White polyurethane case with a yellow polyurethane bracelet. Fixedorange polyurethane bezel with Adidas logo. Stainless steel case back. Model: ADH6083. 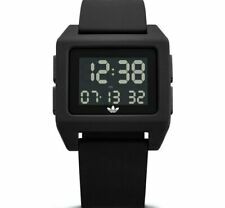 Adidas Original Candy Unisex LCD Watch. Size: Unisex. You may probably need to change a new battery by yourself eventually.". Colour: Pink. Item number: ADP6015 Furano Collection! Adidas engraved. The pictures are actual item. FREE Trial! This item has a really luxury design. Model # ADH6024. Tokyo's naturally streamlined design leaves it in a league of its own. Style : Unisex Watch. Very hard to find now. Don't miss out this extraordinary chance to get this watch! MODEL - ADH2521. Model number: ADH2521. Part Number: ADH2521. Adidas Spectator Chrono CLEAR Dial Unisex watch. Watch Information. Dial window material type : Mineral. Item Shape: Circle. Band Color: CLEAR. MODEL - ADH2531. Model number: ADH2531. Part Number: ADH2531. Adidas ChronoGRAPH SILICONE STRAP AND Dial Unisex watch. Band material: SILICONE. Watch Information. Band Color: PURPLE. Band length: unisex. Gender: Unisex. Watch Information Material Band: Silicone/Rubber. This could cause the watch to stop running. Here are how to "jump start" a watch: 1. pull crown all the out and turn 2-3 rounds; 2. hold the watch sideways, firmly and repeatedly tap the non-crown side against a wood surface.